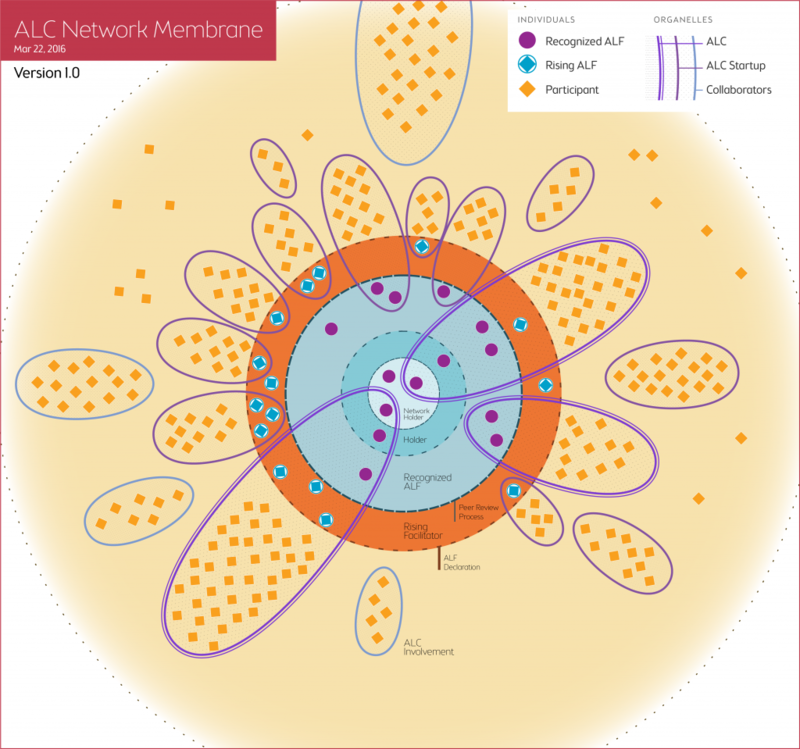 I’ve updated my diagram of the ALC Network membrane (see v0.1 here) in two major ways. I’ve simplified it, practicing design through subtraction, and I’ve changed how I related to it. Initially I thought of the ALC Network membrane as the center of a flower with each ALC acting as a pedal. I am now thinking of it more as a cell. The cell is the ALC network. Inside the network are the organelle that give the cell life or the organizations that make up the network and give it life. These organizations right now are Agile Learning Centers, but aren’t limited to that particular structure. The nucleus contains the protocol that keep the cell functioning. 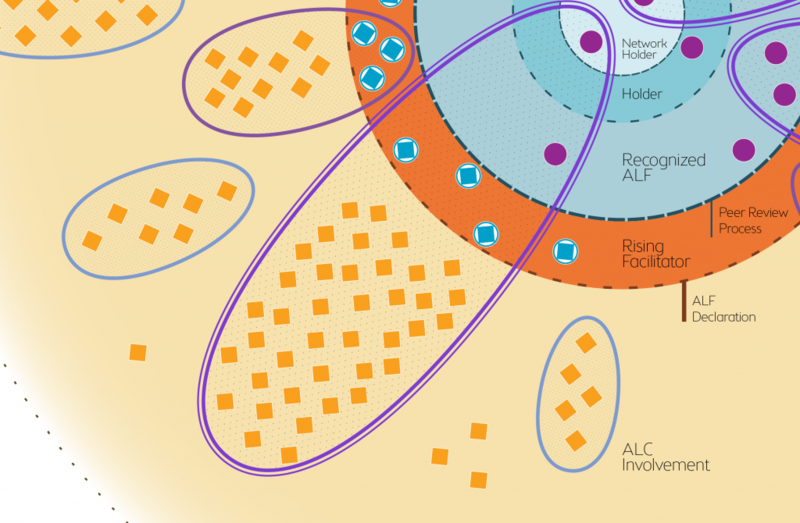 This is the facilitation layer where Agile Learning Facilitators hold the network protocol and tend the ALC methodology. The people are the little bits of magic that power the whole thing. Participants represent anyone who isn’t within the ALF membrane, this could be a parent, student, supporter, coach,alumni, resource person, or intern. ALFs anchor organelles to the nucleus and close a feedback loop between the center and edges of the cell. Individuals can exist outside of organelles or span multiple. The nucleus is made of four layers, the outer membrane which is porous allows in new people who wish to be ALFs. They interact with the network until they are recognized (through a peer review process) into the blue part where ALFs play. 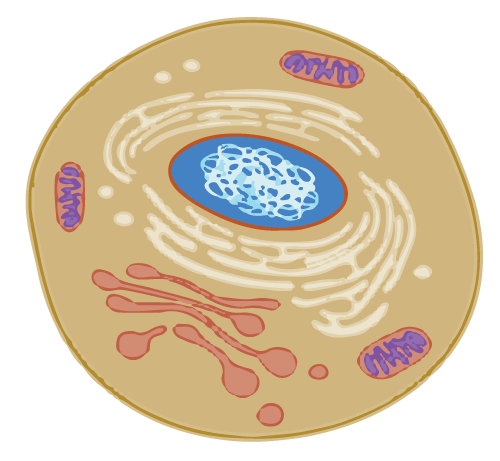 The inner circles take on more responsibility for the organelles as holders and then the entire cell as network holders. 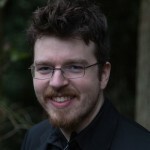 As always I would love to read your feedback. What can I expand on? How clear is this as an insider or outsider? Phenomenal work Drew. I simply love what you do. You do it so gracefully and make things so much more understandable (at least for me). I like the version that shows each ALC’s name and represents the status of the people in it. I hope to create a living version that draws Individual and organelle (ALC) names from the website and renders them with more detail. That’s a much more future version though. Looks great, Drew. I really appreciate you taking the cell metaphor further than in the first version. This metaphor is the most complete in my mind — not only does it make the most sense from an organizational structure, but it is somewhat of a fractal metaphor (if I may use such buzzword), as it can be applied on various levels. Would also love to see what @artbrock thinks of it so far — I think it is a great illustration of the new (and completely natural) way in which we are relating to ALC as a social organism, rather than a corporation or whatever. Yay! I love the organic / cellular metaphor and way of thinking of it. It does seem true to the nature of the flows. The network (nucleus) isn’t trying to control or micromanage the schools or their activities, but we are trying to hold a general sense of coherence of vision/purpose while facilitating flows of insight, resources, communication and opportunity between them. ALFs are the primary conduits of this good stuff because they’ve stepped into a level of commitment and participation where they participate in the channels of information flows, planning, and strategizing these things. I really appreciate how the ALC Network has evolved to really embody these organic patterns of flow INSTEAD of being about hierarchy, power, or control. It feels like it’s working pretty well… and it’s really useful to have this kind of diagram and explanation for newcomers trying to figure out how to navigate our space. Thanks @artbrock, I hope to create an explanation of flow through the system. Show how feedback flows into the nucleus and then spreads out to the network. how to judge good free classifieds website to post a free ads?I am looking for a quality and free classified website to post all my ads. I know some of the good ones but is there any trick to judge the potentiality of free classified website to get maximum exposure to my ads.